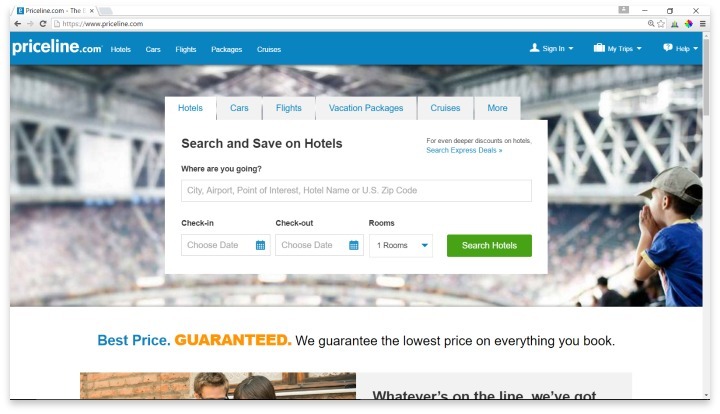 Priceline is an online hotel, flight, and car rental booking service that has become as much of a household name as other industry leaders like Travelocity. With William Shatner endorsing the product through humorous commercials, Priceline has developed a reputation of being savvy and luxurious while maintaining their budget-friendly style. The Name Your Own Price tool is a big draw for Priceline, which allows users to bid on hotels, flights, and other reservations in an eBay-style auction. While other travel sites focus on helping you create a total package vacation, or on extensive searches for the lowest available prices, Priceline puts all their eggs into the auction-style deal making feature, which can be an excellent tool for the serious bargain hunter. Like many other travel booking sites, Priceline’s search function is fairly quick and intuitive to use, though they do lack one major feature: there is no way to search for accommodations or flights based on a range of dates for the flexible traveler. This might lead to extra searches as you narrow down the cheapest days to fly or check in. You can book flight and hotel packages, or flight and car rental packages, but there is no option for all three services bundled into one. There are also regular updates to the Express Deals section of the website, where bargains as high as 50% off can be found on last-minute bookings. You can also get quotes directly on the site for group rates, rather than having to speak to a representative like many other websites. The Name Your Own Price tool comes with both good and bad. Obviously, you can save a ton of money if you use this tool wisely. You’ll need to do a bit of legwork to ensure that you’re not bidding higher than a deal you could get elsewhere, but once you know what you are willing to pay, you enter the bid and your card number. If the hotel or flight accepts your bid, you are charged automatically. Now here’s the bad: For hotels, you won’t know which exact hotel you’ve booked till you’ve paid. You’ll see a list of amenities, a star rating, and what town it’s in, but nothing more than that. For flights, you’ll be able to see what airline and destination, as well as departure date, but not the specific time. You run the risk of booking yourself a red eye using this tool. For a traveler whose only concern is getting rock-bottom prices, these concerns may be minimal. Priceline is an online hotel, flight, and car rental booking service that has developed a reputation of being savvy and luxurious while maintaining their budget-friendly style. If saving money is your main concern when traveling, Priceline should really be your final stop. After you’ve done a bit of research on your own, check the Express Deals, and use the Name Your Own Price tool till you get the lowest price anywhere on the Internet. With everything you need right on this site ready to be booked, it won’t take long after your initial research to get in and out and on your way. If you’re a constant traveler, signing up for the membership bonuses and using the mobile app can help you save even more. Have you had an experience with this company? Please share your Priceline reviews below. I like Priceline and have used their services several times for hotels. Feel pretty good about the rates and service overall.